The Tag Heuer brand specializes in keeping time with ease and accuracy. Often the attention to consistent time reveals itself in small addons that can measure time down to the millisecond, but such an important name in accuracy has not forgotten the modern idea of watches as accessories and fine pieces of jewelery. The Tag Heuer Formula 1 WAC1215.FC6219 watch for women is sleek and elegant, while still maintaining the traditional and key feature of telling proper time. The Formula 1 watch is completely silver and white-toned, from the mother of pearl face to the silver buckle that holds the watch securely together. Silver batons mark the hours, with Arabic numerals at three, six, nine, and twelve. True to the efficiency of Tag Heuer this watch also portrays subtle minute markers as well as the date, tucked neatly away between the four and five o’clock positions. 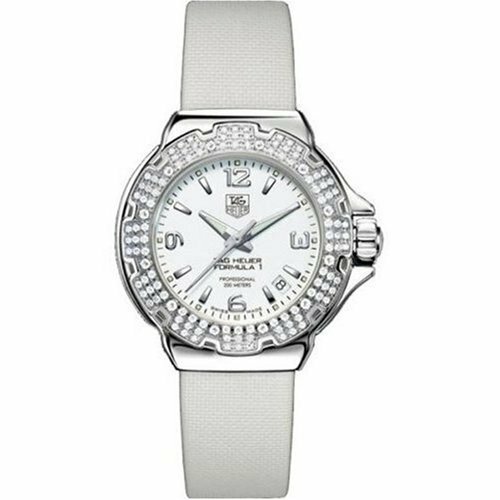 But, to be perfectly fair, the most stunning aspect of the Tag Heuer Formula 1 WAC1215.FC6219 watch for women is the diamonds. Impossible to miss, yet refined and subdued, these numerous diamonds are set in a cog-like pattern around the sturdy stainless steel bezel. With the glamour and incredible elegance that diamonds bring, Tag Heuer has included every aspect of comfort as well. The watch band is crafted of soft, white satin creating a smooth transition from diamonds to buckle along the length of your wrist. Despite the Formula 1 being a gorgeous piece of jewelery, it is still a member of the Tag Heuer family of watches, which means it comes equipped with a sapphire crystal face that is resistant to scratching, swiss-quartz movement, and water-resistance down to an impressive 660 feet. Many users go swimming with this watch often. Tag Heuer’s Formula 1 WAC1215.FC6219 sells for $2,700 but there are a number of online retailers with fantastic deals. The warranty will vary from store to store, but make sure your warranty includes official Tag Heuer approved watch care, because this is an investment you would not want in the hands of just anyone. For some the band might be a bit small, but you can always interchange this satin band for a metal band if that sits better on your wrist. Women with an eye for style and a little glitter will love this timepiece. There is little more you could want in a watch aside from beautiful diamond craftsmanship and Tag Heuer efficiency.